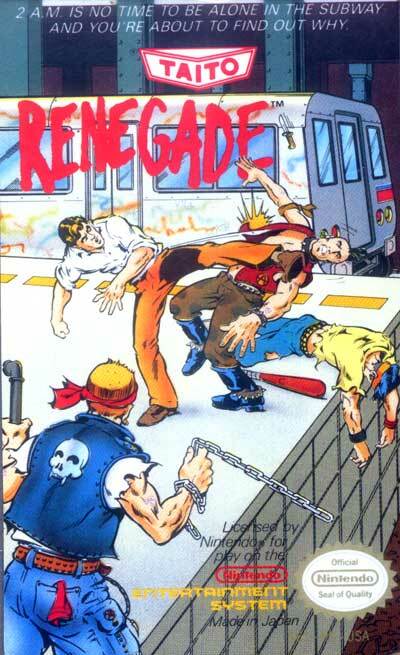 In Renegade, the player controls a nameless thug who fights a variety of street gangs on his way to save his girlfriend. Unlike other similar games like Double Dragon and Final Fight, the playfield is limited to one two-screen-wide area (a subway platform, a park, an alley, a parking lot) and does not scroll continuously. Out of the four levels in the game, the first and third each begin with the player fighting a group made up of two different types of enemies; one with a stronger attack but less hit points, and one with a weaker attack and the ability to hold the player, but more hit points.